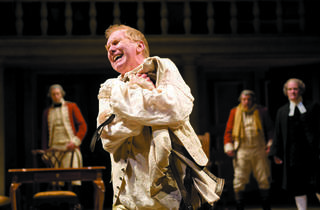 Harry Groener rules as the English monarch in a handsome Chicago Shakes production. It’s not so good to be the king, suggests Brit playwright Bennett’s 1991 comic work. Still stinging from the loss of the American colonies, George III is beset by a mysterious illness that appears to be both physical and mental; tortured by abdominal pains, unbearable skin sensitivity, insomnia, incontinence and the indignities of 18th-century medicine, George seems to lose his mind as well—a turn of events that his political enemies, including his son, the callow Prince of Wales, see as an opportunity. 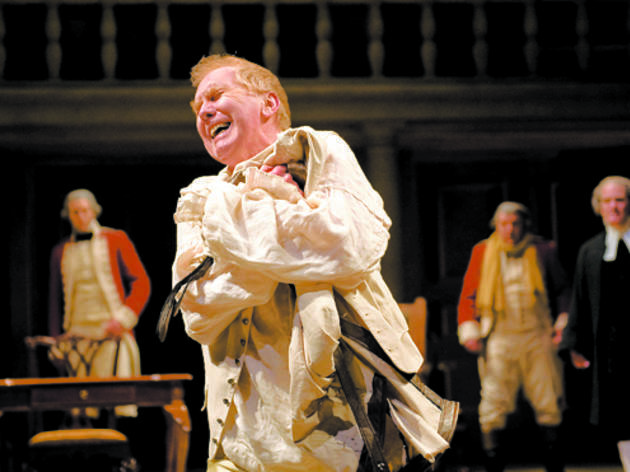 Bennett’s script seems to endorse an odd view of mental illness; though the playwright adds as a footnote that historians now believe George’s madness was caused by porphyria, a genetic disorder, in the play he’s presented as overcoming dementia via behavioral therapy (“He must be broken as a horse is broken,” says the doctor credited with “curing” him). The political intrigue is rather perfunctory as well; aside from George’s upright prime minister (Nathan Hosner) and the cartoonishly foppish prince (Richard Baird), the players are too lightly sketched and too numerous to track. But Bennett’s extraneous overstuffing aside, he offers an outstanding character study in George, and Groener tackles it masterfully. A three-time Tony nominee for his work in Broadway musicals, Groener brings a musicality to the rhythms of George’s desperate, babbling descent and eventual reemergence. Metropulos’s handsomely appointed staging sags when Groener’s offstage; when he’s on, it sings.